Launching a successful podcast doesn’t happen overnight. We’ve made more than a few mistakes getting Agency Advantage off the ground, mistakes you won’t have to learn the hard way. Following is the exact process we used to start and grow a successful podcast. At Hubstaff, content marketing is the primary driver of our growth. Central to that strategy is our Agency Advantage podcast. This initiative lets us demonstrate thought leadership within our most valuable customer segments and generate new content for our marketing efforts. Before our podcast, our educational content was published as articles on our blog. Most of the content focused on issues important to startups. But our clients aren’t just startups. They’re also digital agencies that have been around the block a few times. They’ve experienced a certain level of success but are still looking for ways to grow and manage their team. We wanted to create content for them. But there was one problem: we aren’t an agency, and we have no experience running one. To reach agency owners before the podcast, we relied on guest posts by other agency owners. This filled in some gaps but did nothing to establish us as an authority in the agency world. Launching a podcast helped us do exactly that. The podcast also helps us reach qualified prospects organically through search, social sharing, and word of mouth. But the real value of the podcast is that it lets us demonstrate an understanding of our clients’ business. This is critical for building long-term relationships. A year since launching, we’ve published 57 episodes of the podcast, it has been downloaded tens of thousands of times, and it’s consistently delivering actionable content to a core segment of our target market. The first and most important step in launching your podcast is identifying your focus. Don’t just gravitate toward what you know best. Focus on what your ideal customer is interested in. As is true of any content marketing effort, you need to put their needs first. It can’t be about you. Your podcast should focus on content your customer wants to consume, even if it doesn’t directly have to do with your service. For instance, for a screen printing company that sells uniforms to baseball leagues, that might mean developing a podcast about youth sports. 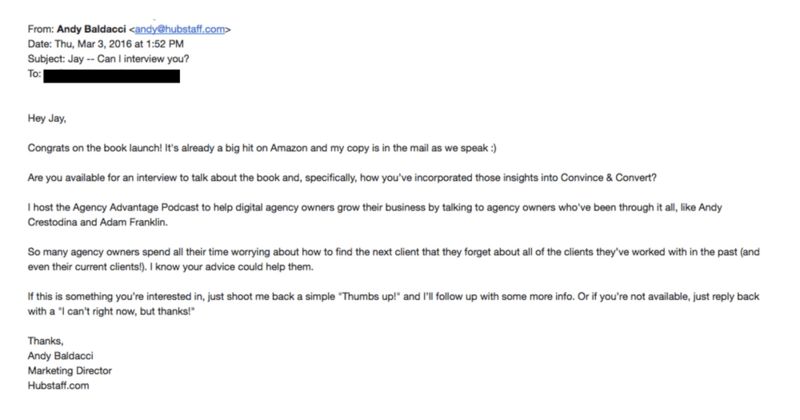 An email marketing company might decide to produce a podcast that focuses on copywriting. Get creative. Selling your product or service is an afterthought at this point. Your goal is to help the customer. This stuff isn’t glamorous, but it’s important for producing a successful podcast. Get it right the first time and you’ll save yourself hours of trial and error. When we first launched the podcast, we spent days researching our options before deciding to do everything on our own. We didn’t love the all-in-one solutions out there and wanted more control of the process, so we followed a startup’s natural DIY instinct. We hosted the podcast on Amazon S3, spent hours figuring out how to sync it with our RSS feed, and struggled to uncover the stats that mattered from the raw data. All this was a huge waste of time. It wasn’t worth the bit of money we saved doing everything from scratch. So when you launch your podcast, opt for an all-in-one solution like Libsyn or Blubrry. If you go with one of these, don’t use their default player. It’s pretty terrible. Instead go with Pat Flynn’s Smart Podcast Player. It’s easy to use and integrates seamlessly with your website. Doing it ourselves did give us more control, but that added control isn’t important. It’s far better to optimize for ease of use and time. This means going with a service that can do it all for you. To be honest, Libsyn and Blubrry are both outdated and somewhat clunky, but they’re a lot simpler than figuring it out on your own. After you choose the focus of your podcast and figure out the technical details, it’s time to create your first podcast and start building an audience with it. Launching a successful podcast doesn’t happen overnight. I’ve made more than a few mistakes getting Agency Advantage off the ground, mistakes you won’t have to learn the hard way. What follows is the exact process we used to start and grow a successful podcast. When you’re just getting your podcast off the ground, you don’t have a track record to use to convince guests to come on the show. This makes getting initial guests a challenge. However, there are some things you can do to overcome this. Leverage your network. Your personal and professional relationships are the best places to look for guests. If you don’t have a network, start building one now. It will make growing your podcast a whole lot easier. Keith Ferrazzi’s book, Never Eat Alone, is a great guide to building professional relationships. Find common ground. Beyond your personal network, look for similarities you can use to get your foot in the door with a prospective guest. Think points of commonality like same city, same hometown, same college, and similar interests. Make it easy. In these early episodes, your guest is doing you a favor by agreeing to come on because you can’t promise them much in return. Make it as easy as possible for them to say yes by getting right to the point and not creating more work for them. Following these tips, write an email that’s personalized and to-the-point. Give your guest a clear next step. Templates are great for this sort of cold emailing, but you shouldn’t be spamming out the same email to potential guests. The people you want on your show are busy people, so show them you respect their time by spending your own time to research them. Then, customize your pitch based on that research. Notice the personalized subject line and intro. This is key to getting someone popular like Jay Baer to respond. 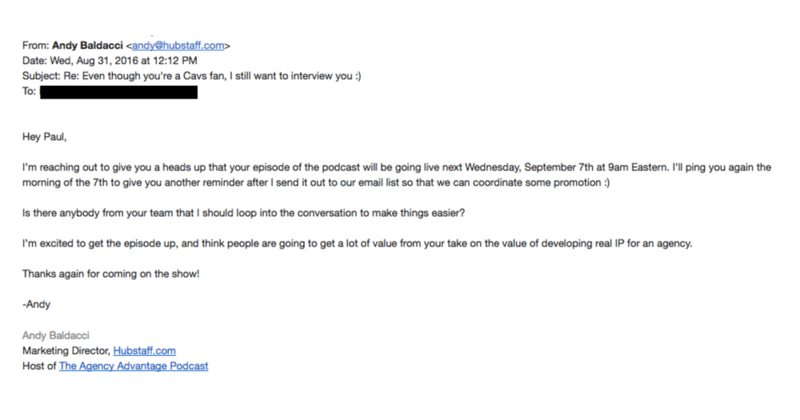 There’s no reason to waste time emailing back and forth for podcast scheduling. Use a simple, automated tool like Calendly to prevent this. Again, the goal here is to respect your guest’s time, let them know what to expect, and make everything very easy. Once you have a time set, send your guest a simple agenda of what you intend to cover in the interview. To put together the agenda for the show, study up on your guest. Some folks like to ask the same questions of every guest while others prefer spontaneity. Either approach can work, but pick a framework that works best for your show. Think about what your audience is most interested in and base your outline and questions off that. Once you’ve sent the agenda to your guest, add them on Skype so you’re all set for the interview. Unless you have the personality of a radio DJ (I don’t), it’s going to take practice to get into a rhythm of interviewing guests for your show. I was shaky at first and have become much better, but I still have a long way to go. For me and others podcast hosts I’ve talked to, the biggest challenge is bringing enough energy to each and every episode. In my experience, the easiest way to do this is to find topics that genuinely excite you instead of just reading a list of scripted questions. Get interested in your guests and let that interest carry the interview. After recording, immediately back up your call to DropBox, Google Drive, or another cloud storage system. Your guest has been generous enough to help you out. Sending them a message about how you lost the recording is an embarrassing one to send. After the interview is recorded, I record a simple intro and outro for the episode. The intro offers a brief background, introduces the guest, and teases the subject. The outro focuses on the most important takeaways from the interview. With everything recorded, you’re ready to edit. For most podcasts, the value is not in the production but in the content. So instead of learning how to edit the audio yourself, outsource this and spend your time focusing on what you do best. Keep these simple when you’re starting out. At Hubstaff we create thorough show notes that can stand on their own as valuable content. But it took a lot of time to nail down a process for creating them. There’s no right or wrong way to do this. Before publishing, set your ID3 tags. These tags contain information and metadata about your podcast episode. Using a free tool (here’s the tool I use), you can add the ID3 tags to your mp3 audio file. After adding these tags, save the file and upload it to your host. Once the the RSS feed updates, it will be published. When this is completed, send an email to people who have subscribed to receive new episodes. If you end up building a list with a podcast launch landing page or something similar before launching, send an email about your first episode to them. Another easy way to promote your podcast is to submit it to directories. The largest podcast directory is iTunes, followed by Stitcher and Google’s Play store. There are others you can take advantage of though. The Podcasters’ Studio has a great list of places to publish your podcast. Note: iTunes and other directories require an image for your podcast. I recommend outsourcing image creation to freelancers on Fiverr or Hubstaff Talent. Throughout the process, be sure to keep the guest in the loop. You can use templates to make this easier, but every email should be personalized. Keeping guests in the loop goes beyond common courtesy. 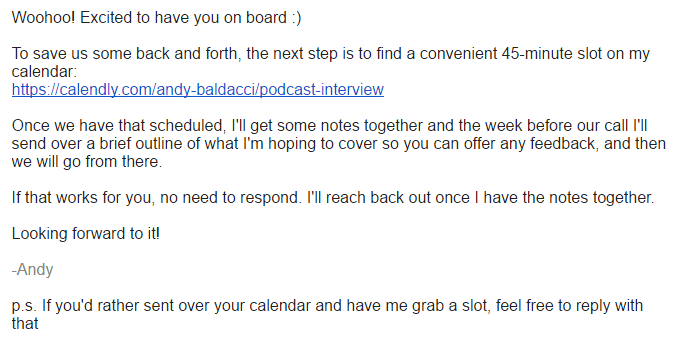 Politely asking for their help with promoting the podcast is an easy way to broaden your audience. If you can produce a regular podcast, you’re already miles ahead of your competition. But if you’re simply interviewing somebody once and stopping there, you aren’t maximizing what you’ve built. If you do it right, your podcast can drive most or even all of the content for your blog. What you do with it is really up to you. If you really want to improve your podcast ROI, check out what James Carbary is doing. James was a recent guest on Agency Advantage. He shared his process for building a multi-million dollar sales system with podcasts. Before you know it, you’ll have guests knocking down doors to be on your podcast. And you’ll be coming up with so many ideas for future episodes you won’t know what to do with them all. To stay sane, you’ll need a backlog of episodes to give yourself a buffer because you’ll often be coordinating multiple interviews at the same time. Keep things organized and on track with project management software for your podcast. We use Trello to help manage our process for Agency Advantage and it’s been invaluable. Is this the absolute best way to manage your podcast? Probably not. But it’s simple and it works. You need to have a system for keeping track of everything because things will fall through the cracks if you don’t. Releasing the first episode is the hardest part of launching your podcast. The second hardest part is continuing to release new episodes. Whether you use Trello or something else, set up systems and processes that are easy to follow. We’ve interviewed dozens of amazing guests, built a rapidly growing audience, and began establishing ourselves as authorities in the digital agency space. 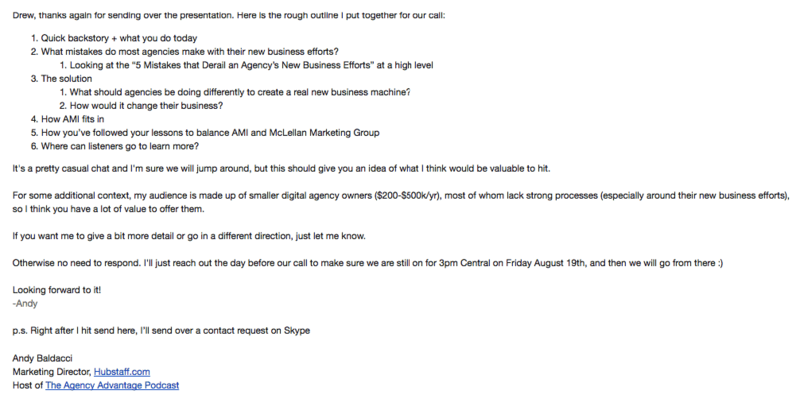 While I’m proud of what we’ve accomplished with the Agency Advantage podcast thus far, I know there’s more to be done. We’ve generated a lot of excitement among people on the Hubstaff email list, but if we want to grow the show we have to find ways to expand our audience. Moving forward, some of my priorities for reaching new listeners include appearing on other podcasts and writing guest posts for other blogs. I’ll also be experimenting with driving podcast listeners to a webinar or lead magnet that introduces them to Hubstaff. Now that the podcast has some traction, there are a lot of opportunities to use it to bring in more popular guests, new listeners, and new business. This is what you can look forward to after you start a podcast and publish new episodes on a consistent basis. I won’t pretend it’s easy, but hopefully this guide will make it a little easier. If you have any questions about getting started, don’t hesitate to reach out to me at andy@hubstaff.com. I’m excited to hear about what you come up with. This article originally appeared on the Hubstaff blog. It is reprinted here with permission from Hubstaff because of the great value we think it brings to the Digital Doughnut community!